This year, in addition to Disneyland guests' favorite holiday fun in the form of parades, fireworks, and, yes, even snow, new surprises await. (KGTV) — The holidays have begun at Disneyland and California Adventure Park, bringing back the annual seasonal tradition so many San Diegans have come to cherish. This year, in addition to guests' favorite holiday fun in the form of parades, fireworks, and, yes, even snow, new surprises await. Disney Festival of Holidays brings together live entertainment from holiday toy and a delicious, diverse dishes from around the world. Dancing and musical performances from Holiday Toy Drummers, Mostly Kosher, Blue13 Dance Company, and the Grammy award-winning Mariachi Divas will surely keep families entertained outside of the California Adventure's rides. And come with an empty stomach, because there's plenty of international flavors to try at the Festival of Foods Marketplace. 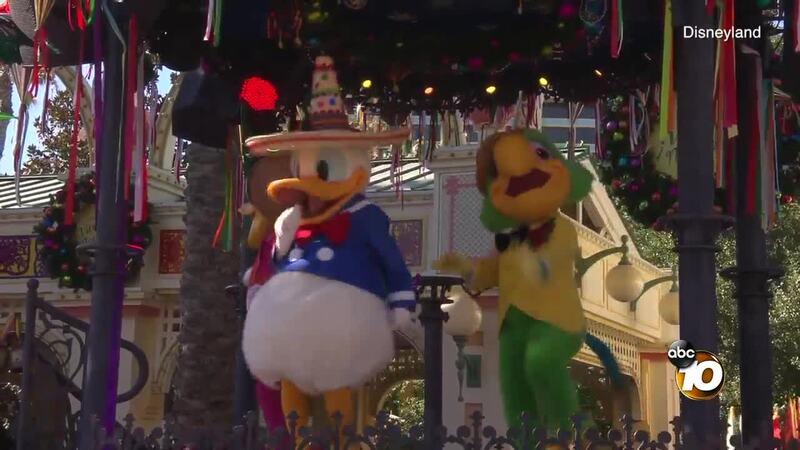 The Three Caballeros will also host a Disney iViva Navidad! street party, with folklórico and samba dancers and live music. Cars Land is dressed head-to-toe in its holiday best and Santa himself will be at the park's Redwood Creek Challenge Trail. Guests may even catch "Santa Goofy" making the rounds! Over at Disneyland, classic holiday fun is everywhere, from the Haunted Mansion to It's a Small World rides. "A Christmas Fantasy" parade runs daily, marching toy soldiers, favorite Disney characters, and Santa (how is he everywhere at once) down Main Street for a bright and cheerful celebration of the holidays. Sleeping Beauty's Castle has been winterized with shimmering icicles and a massive, 60-foot Christmas tree greets guests as they enter the park. Downtown Disney is getting in on the fun as well, with special entertainment, holiday-inspired goodies, and decorations without admission to the park.